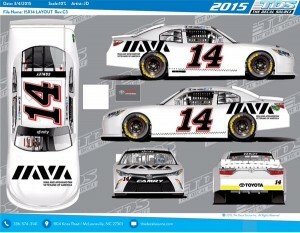 TriStar Motorsports and the Iraq and Afghanistan Veterans of America (IAVA) are proud to announce a new partnership for the NASCAR XFINITY Series’ Boyd Gaming 300 at Las Vegas Motor Speedway this weekend. 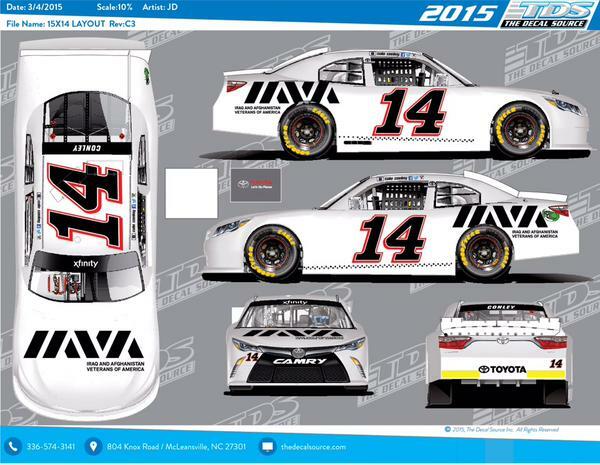 The IAVA will grace the hood and quarter panels of the No. 14 Toyota Camry piloted by Rookie of the Year contender, Cale Conley. Founded in 2004 by an Iraq veteran, the IAVA has quickly become the nation’s largest nonprofit, nonpartisan organization representing new veterans and their families. With nearly 300,000 veterans and civilian supporters nationwide, IAVA is the only 21st Century veterans’ service organization (VSO) dedicated to standing with the 2.8 million veterans of Iraq and Afghanistan from their first day home through the rest of their lives. In addition to their presence on Conley’s No. 14 Toyota Camry, IAVA and the TriStar Motorsports drivers will be at the Holiday Inn Club Vacations at Desert Club Resort on Friday, March 6th from 6:00-8:00pm PT. Fans can visit the resort to participate in raffles, meet the drivers, and learn about the work that the IAVA does. A portion of revenue booked over the race weekend will be donated by Holiday Inn Club Vacations to the IAVA. Be sure to tune into the Boyd Gaming 300 on Fox Sports 1, PRN and SIRIUS XM Channel 90 on March 7th at 4:00PM ET. TriStar Motorsports NC, LLC currently fields Toyota Camry’s in the NASCAR XFINITY Series for Mike Bliss, Cale Conley, Blake Koch and David Starr. Located in Mooresville, North Carolina, TriStar Motorsports has competed in the NASCAR Nationwide Series since 2010; fielding cars for some of NASCAR’s top drivers. To find out more information about TriStar Motorsports please visitwww.tristarmotorsportsnc.com, like us on Facebook and follow us on Twitter.